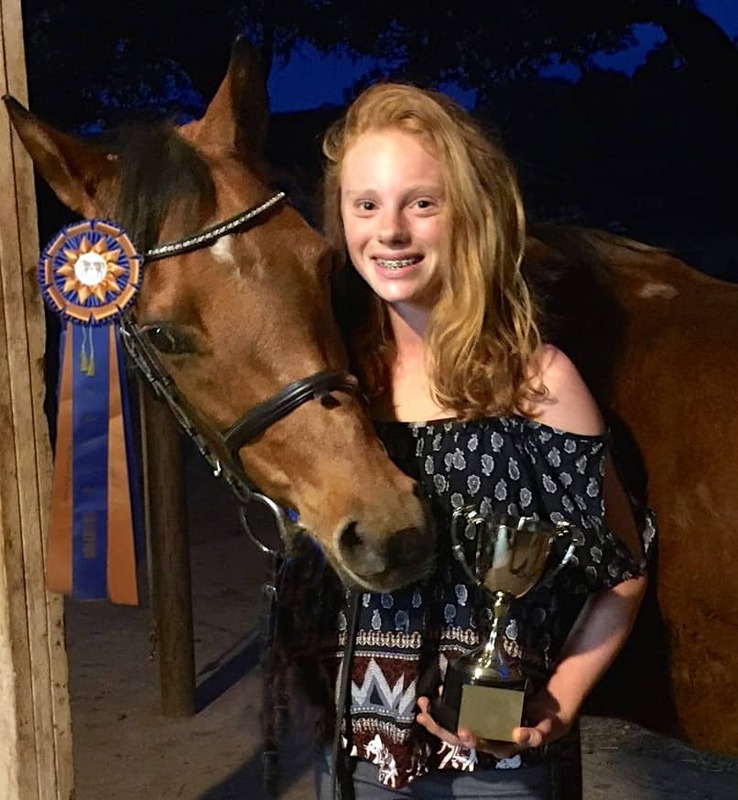 , Wednesday, November 2, 2016 — Nampa, ID (October 25, 2016) – Winning the Accuhorsemat Cup at the 2016 Sport Horse National Arabian and Half-Arabian Championship Horse Show in Nampa, Idaho, is a laudable feat for anyone, but for 12-year-old Lucy Bartlett it was an especially sweet win. The Accuhorsemat Cup is awarded to riders who stay calm under pressure and whose horses remain relaxed during the stresses inherent to every horse show, and Bartlett and Angyls Among Us fit the bill. Angyl is an eight-year-old Crabbet-bred mare by the sire of A Love Song. She is three times removed from Bask ++, and her dam was Afire Bey V. Barlett has owned her for a year and a half. She and Angyl competed in Open and Amateur Training Level Dressage, Open and Amateur Sporthorse In-Hand, and Open and Amateur Sport Horse Under Saddle classes at the 2016 Sport Horse National Arabian and Half-Arabian Championship Show. Accuhorsemat, an innovative equine acupressure blanket, not only rewards those horses and riders who avoid tension under pressure, but also actively helps horses and riders to remove tension. The Accuhorsemat stimulates key acupressure points across the body to release tension in connective tissue, allowing for more mobility and pain relief. The Accuhorsemat has added benefits of helping loosen a horse before exercise and calming an anxious horse. Post workout, it helps sooth tired muscles. Bartlett not only received the impressive Accuhorsemat Cup trophy, but also won an Acuswedemat – an acupressure mat designed for people – as part of her award. The Acuswedemat provides the same great benefits for the rider – reduced muscle tension, reduced pain, and overall relaxation. The Accuhorsemat blankets were developed in Sweden to address the needs of performance horses experiencing challenges with stiffness and recovery. After showing their effectiveness in Europe, the blankets and the mats for people were brought across the Atlantic. Acuswede, the North American distributor of the Accuhorsemat and Acuswedemat, now brings the healing properties of acupressure to competitive equestrians in North America. To learn more about Acuswede and the equine and human acupressure products that the company provides, visit www.acuswede.com.